Port Metro Vancouver: On January 1, 2008, the three Lower Mainland port authorities Fraser River Port Authority, North Fraser Port Authority and Vancouver Port Authority were amalgamated to continue as the Vancouver Fraser Port Authority (VFPA). Now VFPA is called as Port Metro Vancouver. is one of the world’s finest natural, deep-water harbours. it covers 247 km of coastline from Roberts Bank at the U.S.-Canada border. the Vancouver Port Authority controls 6,000 hectares of water and 460 hectares of land, most of which is largely occupied by cargo terminals. the Port of Vancouver is North America’s gateway for Asia-Pacific trade. in North America, it ranks #1 in total foreign exports. on the West Coast, it ranks #3 in total cargo volume and #3 for full foreign containers. in Canada it ranks #1 in total cargo handled and #1 in total container throughput. the Port Metro Vancouver handled 82.7 million tonnes of cargo in 2007. 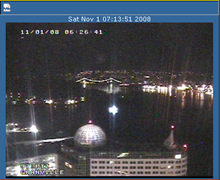 Click the image on right, to have eighteen different views of Port Metro Vancouver through webcam.